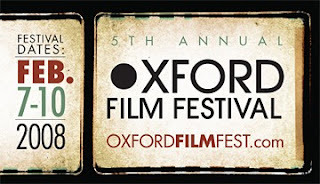 Oxford Film Festival Take 5 With...: Now accepting entries in all categories! Now accepting entries in all categories! The Fifth Annual Oxford Film Festival is now accepting entries in all categories -- animation, documentary, experimental, feature, music video, short, youth/children's -- for its February 2008 lineup. Early bird deadline is July 15 / Regular deadline is September 15, 2007. Mississippi filmmakers are especially encouraged to submit.